Sinfully delicious and elegantly decorated chocolate covered strawberries are a beautiful way to celebrate special occasions. So for Valentine’s Day I had planned on buying some and not making them since it landed on a Monday this year. However, there were so many options – milk chocolate, dark chocolate and white chocolate each with a contrasting drizzle and some dipped in nuts. Since there wasn’t a mix and match option and they were quite expensive, I decided to make them myself. Not only is it easy, but I was able to make them my way with a lot of mix and match options! The recipe amounts below will yield extra chocolate for drizzling and that is why you are seeing smaller strawberries in the center. This is also means you do not have to have to buy the large long stemmed strawberries, the small one will work too. To prove this point I used a large one from the regular container of strawberries and dipped it in white chocolate and drizzled it with milk chocolate – it is the one on the right that doesn’t have a stem. Mix it up by using dark chocolate, coconut, toffee crunches, top with a touch of fluer de sel (French sea salt) or anything you can imagine! My boys told me next time they were going to add sprinkles which might give a whole new look to the elegant chocolate covered strawberry! This will yield about 6 strawberries as shown below. Gently clean berries and completely dry them or the chocolate will not stick. Set aside. In a small non-stick skillet add nuts and a pinch of kosher or sea salt if they are not salted and lightly toast over medium heat stirring constantly until fragrant. This should only take a minute or two. Place on a plate and set aside. Lay out a long piece of parchment paper or wax paper to place the berries on after you have dipped them. When working with chocolate, you will need to work very quickly to prevent it from getting hard. Prepare each type of chocolate separately. In a small to medium sized bowl add 4 oz. of the milk chocolate and microwave for about 2 1/2 minutes stirring and checking on it frequently through the melting process. Cooking times will vary depending on the size of your chocolate pieces and your microwave. The chocolate should be smooth. Remove from microwave and hold the top part of the strawberry trying to keep the leaves from being dipped in the chocolate and rotate the strawberry in a circular fashion in the chocolate to cover all sides leaving part of the top not covered as shown. Dip in nuts if using and place on parchment/wax paper. Continue with the other two that will eventually be drizzled with white chocolate. Add 4 oz. of the white chocolate to a small to medium sized bowl and repeat the process with remaining 3 strawberries, dipping one in the nuts and leaving the other two plain to eventually be drizzled with the milk chocolate. For the drizzle, place 2 oz. of white chocolate in a ziplock style bag and microwave for about 30 seconds. Using your hands squeeze the outside of the bag to “stir” the chocolate. If needed, microwave for a few more minutes until melted. Squeeze out any air, close the bag and migrate the chocolate to one corner of the bag. Using a scissors sniff a few centimeters off of the corner of the bag the chocolate was migrated to. Drizzle over 2 of the strawberries that were dipped in milk chocolate in a back and forth manner. In a separate bag add 2 oz. 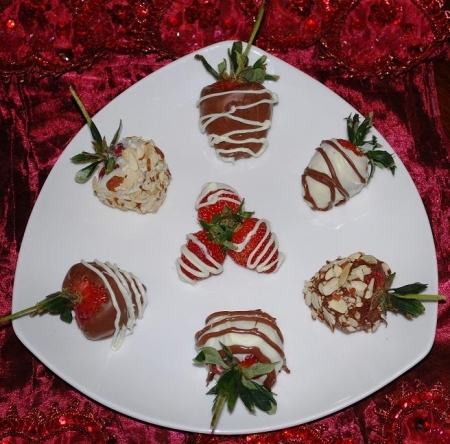 of the milk chocolate and repeat the process with the 2 strawberries that were dipped in the white chocolate. Once dry add to a plate and refrigerate until ready to eat. If you have extra chocolate and strawberries like I did drizzle them too! For a special occasion Champagne or sparkling wine is a must! Try Gruet Rosé Brut Méthode Champennoise Sparkling Wine (France), Veuve du Vernay Brut Rosé Sparkling Wine (France), étoile Rosé Domaine Chandon (California) or Zardetto Prosecco Brut Sparkling Wine (Italy).